It’s been a while since a phone had a cool addition that one can get behind. The New Moto Z Force Droid has magnetic modular add-ons including a speaker, battery and the item we’re going to look at – the Moto insta-share projector. Next. There are Two Versions of the phone: Moto Z Droid and Moto Z Force Droid. We will be looking at the Force Droid, which is the more powerful of the two. The difference is the internal battery – 2600 mAh vs. 3500 mAh, both with a turbo charge option – and the Rear Camera – 13 MP vs. 21 MP. The Moto Z Force Droid itself is one of the thinnest phones out there without add-ons, measuring at a whopping 6.99 mm. The magnetic back allows for easy back cover change. You can get different style back covers for only a couple dollars. Lenovo also stated they will not be changing the style, so any cover or mod you purchase can be used when the Moto Z upgrades. The Fingerprint sensor in front allows for quick access. The sensor is not a Home button, but will bring up the home option with a quick tap. If you keep your finger on the sensor, it will turn the screen off – no matter if the fingerprint is registered in the phone. The Mods easily connect and have their own battery, which also needs to be charged. The phone will help with battery life, with the exception of the Incipio battery pack which is meant to charge the phone. Although the 5.5 inch screen is shatter-proof, many reports are saying it’s not scratch proof. You might want to still invest in a protective screen. The device is water repellent, but not water proof. Moto Mods are not either. So you should keep your phone away from the sink or bathtub. Missing is a Qi charging option, so you might want to get some extra Type-C cords to replace the micro-USB cables we’ve been using for the last couple years. Lenovo beat the iPhone with a device that no longer has a headphone jack. The Type-C USB plug has an adapter so you can plug in your headphones, but you might want to look into a good pair of Bluetooth headphones. The projector has a sensor that will try to adjust perspective and keying. Therefore, if you set the device at an angle, it will fix the image instantly. A fully charged projector brings about an hour of run time. It will then pull from the phone’s battery to keep working. You will be able to watch a movie or two before needing to recharge the phone. The focus is a manual dial and very close to the optics. Therefore it’s a slight challenge to focus in the image without blocking the projector or moving the device. 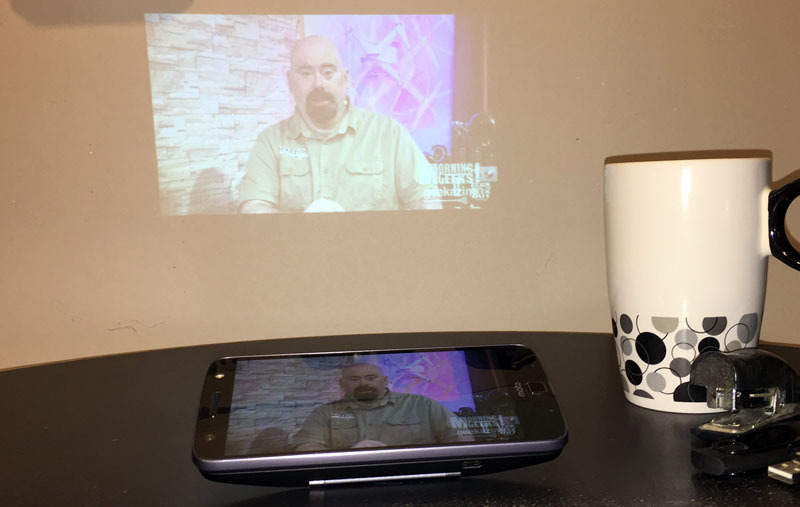 The device gets warm, but more from the phone than the projector. I could still hold onto the device after an hour. The Moto Z is $624 or $26 a month and the Moto Z Force Droid is $720, or $30 a month on a Verizon plan. The Insta-share projector will set you back $299, JBL Soundboost is $79.99 and the Incipio OffGrid Wireless Power Pack will set you back $89.99. This will take you well above $1,000 if you get everything. This is the Moto Z Force Droid phone from Lenovo, the new parent company of Motorola Mobility. An amazing device that has everything you expect in a phone. Like I said, there are two versions of this device at this time, with the Force Droid being the more powerful of the two. This phone has a battery life up to 40 hours without mods. It’s standby time is simply very long, but depends on what apps you install. Android 6.01, or Marshmallow OS, is installed. It has no problems running apps from the Google Play store, and does have some bloatware apps and games that can be easily removed. The 5.5 inch display has a resolution of 2560 x 1440. The Rear camera is 21 MP on the Force Droid with laser autofocus, auto HDR, 4K and slow motion video, and a 1.8 apature. The front face camera is 5 MP with 2.2 aperture and front flash. Like mentioned in the PROs and CONs, the phone uses the new Type-C USB cable. Moto Z also has no headphone jack or micro SD card. There is a 32 or 64 GB choice for internal storage. The phone also has NFC for Android Pay and front-ported speakers, which means the case re-routes the sound to the face of the phone. Therefore, some of you audiophiles might not care for the sound. You can add the JBL Soundboost, but there doesn’t seem to be a Bluetooth option and so if you are watching a video, the audio will be better, but still not directing to your ears properly. The best part is simply the attachments you can get for this device. Perfect for any business professional that needs a phone to last more than 24 hours before charging. Also perfect for anyone that needs to present from the phone. Lenovo stated the add-ons will work with future models of Moto-Z, so when you upgrade you won’t get stuck shelling out another $300. The Insta-share is a 50-Lumen projector that can throw a 480p image up to 70″ in a dark setting and has a lamp life rating of 10,000 hours. I liked that although the device was pretty warm after watching a couple hours of video,I wasn’t buring fingers in picking it up. Although I did not test the Incipio battery and JBL Speaker, I would venture a guess to say they function as well as the projector, most likely without needing as much power or getting as warm. But what’s even cooler is this modular design means other add-ons could be created in the future. So the question is – what do you want to see come to the Moto-Z? Here’s my suggestion – as a video creator, I would love to have a Remote control dolly adapter with video stop-start options, so I can do some fun shots with the 4K or slow motion options as the phone moves by me.